Despite my promising Joe a lifetime membership to the L.A. Zoo, my husband insisted on seeing tigers in their natural habitat. So off we went to India. The driver who met us at the airport turned out to be the only Indian we could communicate with and find common ground. “My top TV show is Breaking Bad!” said our driver. 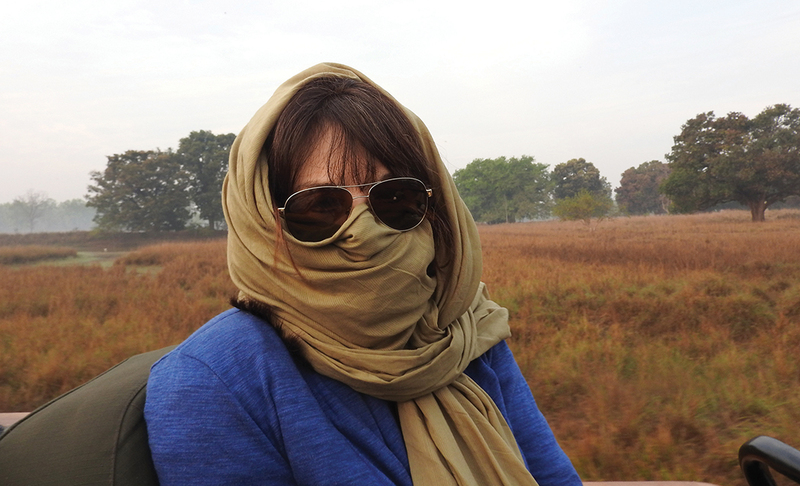 The author, Pepper Edmiston, protects herself from the air in India. Joe wanted tigers, so we visited five lodges, each in a different forest. We traveled hundreds of miles, seeing thousands of people, mostly living on the streets or in shacks. Watching humans drinking, bathing and washing dishes in the same troughs used by animals made me rethink the need for Evian. 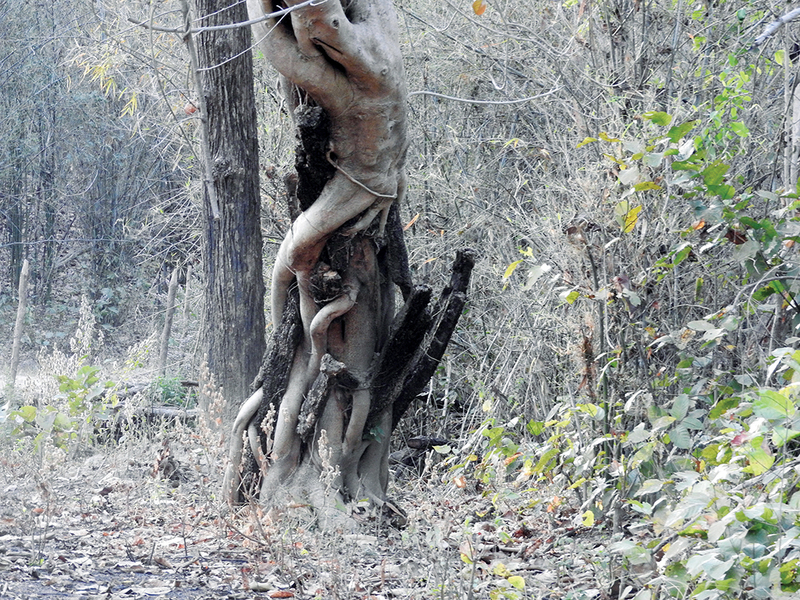 The Strangler wraps around a victim tree and begins sucking nutrients out of it. 2. Dirt with a hole, behind a leafless bush. 3. Dirt with a hole and two slabs of rock to stand on, behind a twig fence. 4. And, la plus belle, dirt with a hole and two slabs of marble to stand on, surrounded by concrete walls. And, because it is almost never heard, the sound of flushing becomes music to one’s ears, like a rarely played Bach sonata. Since I had been warned about the “restroom” choices, I purchased Go Girl!, a purple-hued, rubber device that allows a female to pee like a man, no hormones or surgery necessary. It is shaped like a funnel with a long protrusion. The first time I tried Go Girl! was a failure. So, while fully dressed, I demonstrated for Joe how I used it. Keeping a straight face, my husband explained that for peeing, the appendage should be pointed down; in real life, a protuberance facing up serves a different purpose. To me, the most interesting thing in the jungle was the Strangler Tree. Starting out as an innocent seed, it checks out its neighbors and decides which tree will die. The Strangler wraps its growing tendrils around the victim and begins sucking nutrients out of its trunk, limbs and roots. Years pass until the Strangler is strong enough to stand on its own. Then it’s “Death to the Host Tree!” Sounds like motherhood to me. The weather in India is nothing to write home about. The sky is a shroud of gray, smelling of toxins and smoke, and the average temperature is 100 degrees. But, one day, it rained! Lightning, thunder and buckets of water crashed down on everything! It was wonderful! Of course, that was the day of our five-hour search for the elusive tiger. Our jeep had no roof or sides, just like the “restrooms.” Our ponchos appeared to be waterproof; they were not. In fact, their design allowed us to become fully drenched. Have you ever sat in wet underwear for five hours looking for a tiger? Eyes blinded by rain and nostrils filled with foam, my goal was not to drown while riding in a jeep. After hours of this grand adventure, our guide mumbled something about: “Blah, blah, WET! Blah, blah, CAVE! Blah, blah, TIGER NO OUTSIDE! Blah.” That’s when Joe and I learned that Tiger is Wiser than Man. One fine day Joe and I took a ride on an elephant. The handler rode on the elephant’s neck while we sat on its back. Joe, who has a magnificent voice, loves the sound of it. After the handler repeated three times “I am the elephant trainer and she is my boss,” Joe began a monologue on California flora vs. Indian flora. 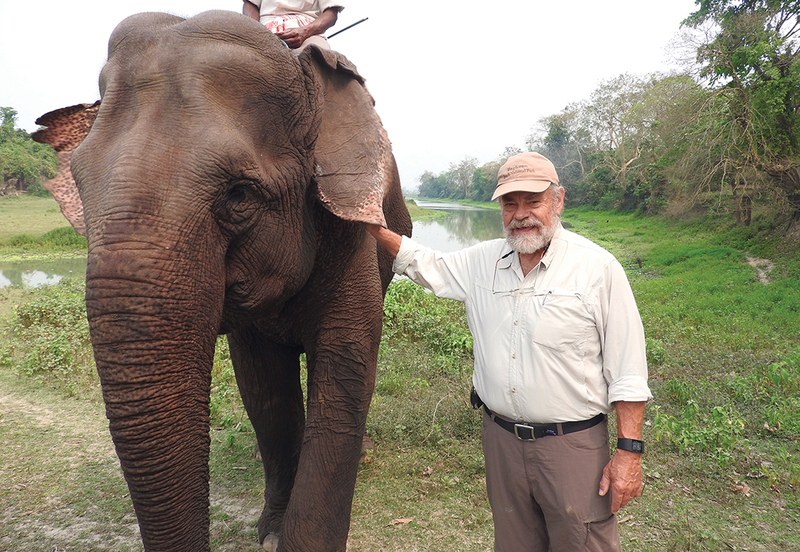 While in India, Joe Edmiston and wife Pepper took a ride on an elephant. On our last day in India we had a few hours before our flight, so we stopped at a large shopping center in Delhi. As we entered, it hit me: And, On the 23rd Day, God Created the Mall. Air conditioning! Flushing toilets! Toilet paper! Drinkable water! Food that would not incur the loss of an organ! Only one thing was lacking in that dreamy place: the gorgeous, brilliant-colored saris that adorned every Indian female. Sadly, in the Mall, all the women wore modern clothes and looked just like me. Many people visit India seeking their spiritual selves. Joe and I didn’t even know where to look. However, we ate amazing food, turning my muumuu into a spandex dress, saw beauty every day and, overall, had a wild time in a fascinating country. Plus, we bought a lot of neat stuff at the Mall. That was extremely offensive, poorly written, and culturally insensitive. I guess I won’t be reading the Palisades News anymore if that means they allow writing like this. “For our entire trip, Joe and I were treated like idiots” — perhaps because you are?? The fact that you couldn’t figure out that a funnel needed to be pointing down to empty properly speaks for itself. Get off of your high horse, this entire article reeks of arrogance and idiocy. This is a disgusting piece and has no place being published. It shows the ugliest lack of empathy that goes hand in hand with unchecked white privilege. This “article” should be taken down immediately. Aside from being Indian and the entire article being offensive, what really angered me the most was that Pepper Edmiston tried to redeem the article by saying that, “However, we ate amazing food, turning my muumuu into a spandex dress, saw beauty every day and, overall, had a wild time in a fascinating country. Plus, we bought a lot of neat stuff at the Mall.” This quote doesn’t make sense when, previous to this quote, all that she wrote was a rant that painted India as a country that is dirty, dull, and should not be visited, as well as all Indians seeming like they’re incompetent savages who cannot communicate properly. Overall this is a vile article that should not have been published and shame on whomever let this article go to print. This article is offensive, and written by someone who is not fit to be writing a Facebook post, let alone an article. As an Indian American, I find this to be inaccurate, offensive and racist. This is why people around the world think Americans are stupid, provincial, idiots. The last time I looked there were poisonous snakes in California… perhaps society and your publication would have been better served if Pepper Edmonton had actually stepped on one of the said snakes. Seriously? What editor in their right mind would ever let an article this offensive be published? Who on earth let this go to print? This is highly offensive and a horrible portrayal of a country with culture deeper than shallow white America.